Then-sophomore defensive lineman Adolphus Washington (92) gets up after tackling an opposing player during the 2014 Discover Orange Bowl Jan. 3 at Sun Life Stadium. OSU lost, 40-35. All it takes to end a career early is an injury. Even if the injury itself isn’t of a significant nature, the possibility remains that the player who steps in as a replacement can do such a good job that the original starter loses his place forever. For junior defensive lineman Adolphus Washington, that possibility became all too real for the briefest of moments last season. After injuring his groin against San Diego State Sept. 7, Washington watched then-freshman Joey Bosa come in and claim the starting defensive end position, opposite then-sophomore Noah Spence. But a late season switch saw Washington take up a position on the interior of the line, something that could take a career that was once hanging by a thread and turn it into something completely different. Now with Washington “inside for good,” he said he has been improving this offseason with the different style of play on the inside. New defensive line coach Larry Johnson said Washington has the right skill set to be successful as an interior lineman. But it’s not just the skill set Washington brings that has Johnson raving, it’s also the drive Washington shows on the practice field. 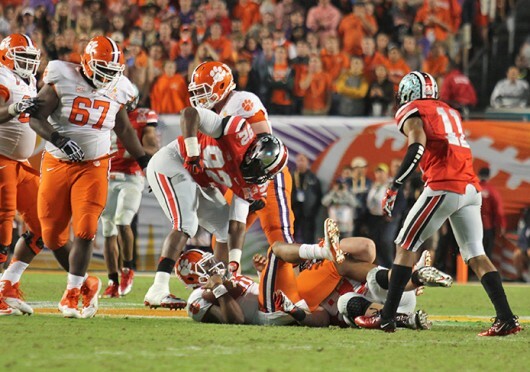 Last season, in limited time, Washington recorded 36 tackles, to go along with four tackles for a loss and two sacks. Even though he played on the interior later in the year after Bosa became established as the defensive end starter, Washington said he was uneasy when practice first started, but that things have improved. “At first I was kind of nervous and scared about it. But now that I got a hold of it, it’s whatever. I am just going to go out there and play,” Washington said. He added that sometimes having to face multiple blockers at once — compared to the one he would face at end more often than not — is what really made him nervous. Johnson said facing the double teams won’t be a problem for Washington, as long as he pays attention and learns from his coaches. Washington is likely set to have his second chance to start on the interior of the line for the Buckeyes — after starting the 2014 Discover Orange Bowl against Clemson — when OSU opens its season Aug. 30 against Navy. Kickoff is scheduled for noon at M&T Bank Stadium in Baltimore.